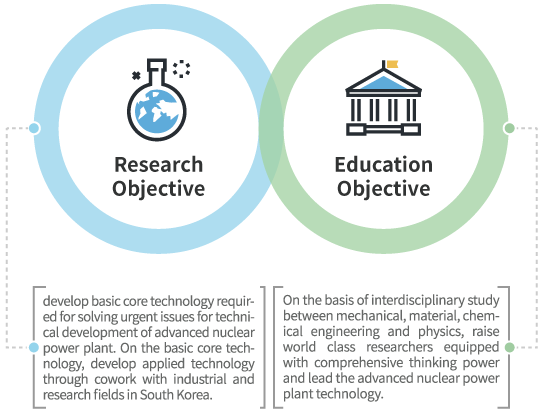 To maintain current international competitiveness in nuclear engineering, and take the lead globally in the development of fourth-generation nuclear reactor in the future. To cultivate core professional human resources who will lead the domestic nuclear power industrial world and having the global competitiveness in the future. To serve Korea to become an exporting country of world-class nuclear power generation through securing advanced nuclear power technology. Capacity building of nuclear-related cutting-edge research performance and manpower training suitable for such performance. Quantitative and qualitative improvement of cutting-edge research through attraction of foreign scholars. Synergy effect creation and competitive leading technology development through specialized collaboration research of various departments including fundamental physics to mega science related to nuclear power. High level research performance in the fusion research sector with the faculty specialized and refined from various departments. Securing of world-class technological competitiveness and high-class manpower creation according to nuclear system development policy as national strategic export industry of the Government.